Need help? We welcome your call. Our on-line order form is secure. Your email is sent with both encryption and using HTTPS. If we have any questions about your order, we will get in touch with you by email and/or phone. (M–Th 9–4 MST) or e–mail us. You are welcome to leave your order on our answering machine any time. Or, you can leave your name and phone number and we will call you back. and fill in your info at the bottom of this page. We will email you the download info. Try our ‘Naturally Iridescent’ PointTwill scarves. Weave 2 fabulous scarves with 2 skeins of our easy to manage silk yarn, Zola (100% Bombyx Spun Silk, 12/2). 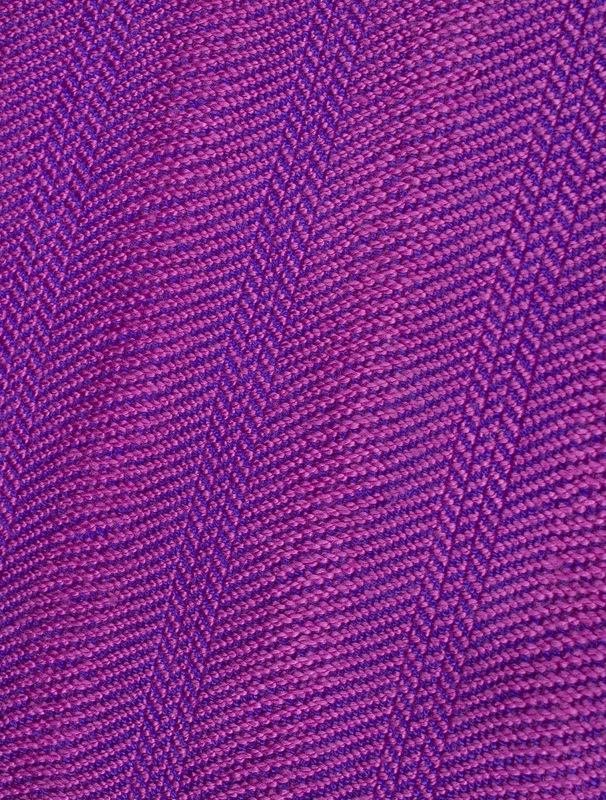 We've added a bit of weft color in our warp--to create edging (makes your selvages cleaner) and some sutble stripes to enhance the diamonds. We've set this just a tick loose for a twill-gives wonderful drape--so you'll need to watch your beat as you weave so you don't pack your weft in too tight. What a perfect gift for someone special! We love combing two colors in this design—your values can be relatively similar as long as you have a strong variance in your hue. We selected complementary colors--and we achieved iridescence! BONUS--we've included an alternate treadling, too! 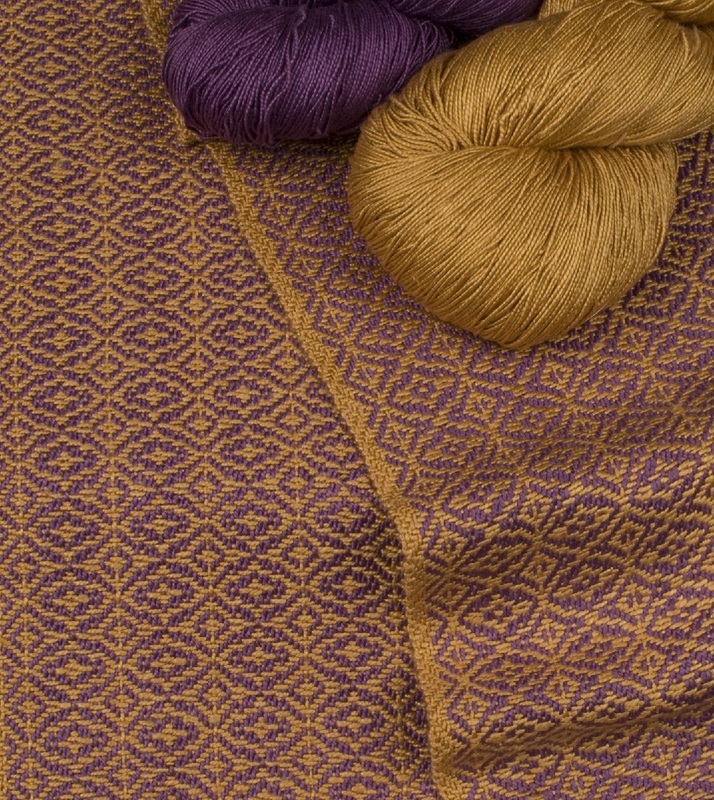 We wove ours with natural dye colors #1014 Lilac in the warp and #1008 Butternut (gold) in the weft. But you can select any two colors you want! Go to Color Now! Zola to order your favorite colors! There are so many combinations that would look fabulous! Here are just a few combinations we like, just to get you started! Or, you can always call us to help you select the right combo for you! toll-free 1.888.383.7455 (silk) When you order yarn, please let us know it's for this draft--we'll make certain you get a 95g or larger skein. 2Skeins makes 2Scarves; each scarf is approx. 5-3/4" wide, 58" long (plus fringe), sett 20 EPI. Try our ‘Playing with Point Twills’ Cramned & Spaced Twill scarves. Weave 2 fabulous scarves with 2 skeins of our most popular silk yarn, Kiku (100% Bombyx Spun Silk, 20/2). What a perfect gift for someone special! 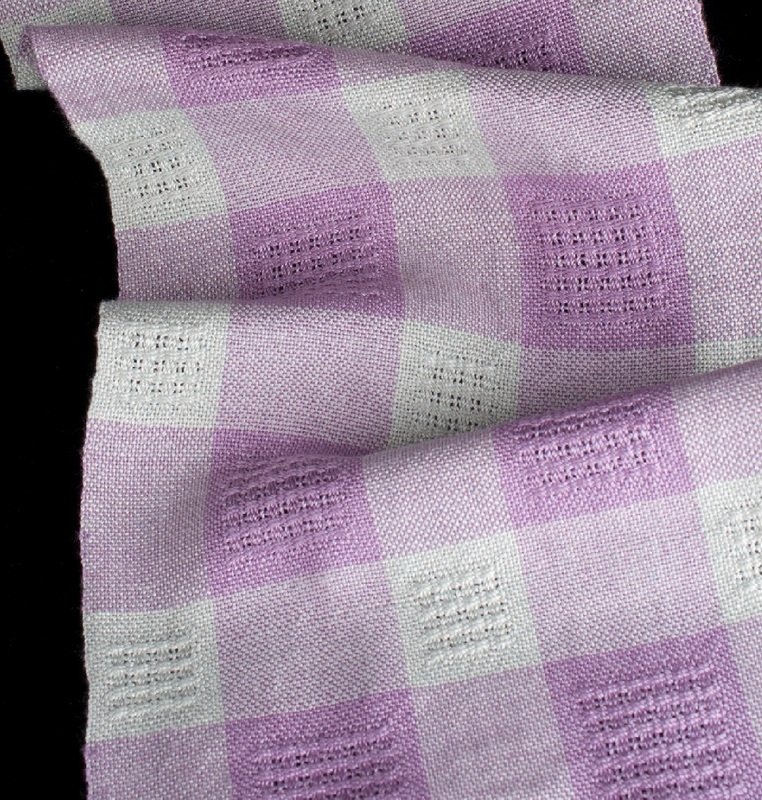 This technique is fabulous—it uses one color in the warp and one color in the weft—so simple to wind warp plus a one-shuttle weave! The shifting sett (crammed and spaced) changes the look between warp-faced and weft-faced. This gives the effect of stripes with soft edges. And bonus—the straight twill lines become gentle curves. We wove ours with colors #1 Midnight Blue (warp) and #43 Harlequin (weft). But you can select any two colors you want! Go to Color Now! Kiku to order your favorite colors! There are so many combinations that would look fabulous! A value difference between your two colors is important --having one color that is lighter or darker than the other is necessary to enble the lovely pattern be visible. Here are just a few combinations we like, just to get you started! Note--you will need a full 100g skein for your warp. Put this note in 'comment' during check out, or call us. 2Skeins make 2Scarves; each scarf is approx. 8.5" wide, 28" long, sett averages 28 EPI. Try our ‘Shimmering Waves’ Grouped Twill scarves. Weave 2 fabulous scarves with 2 skeins of our most popular silk yarn, Kiku (100% Bombyx Spun Silk, 20/2). What a perfect gift for someone special! We wove ours with colors #219 Silk Pajamas (warp) and #210 Berry Blaze. But you can select any two colors you want! Go to Color Now! Kiku to order your favorite colors! 2Skeins make 2Scarves; each scarf is approx. 6.5" wide, 72" long, sett 28 EPI. 4 Shaft Weaving Draft -- FREE! These luxury yarns are so lovely, a simple twill is all that is needed to create stand-out scarves. These are woven on a 4-shaft loom with just two skeins of silk-blends. Anyone on your gift-list would love getting one of these scarves--they are equally lovely for men or women! We created our Simply Elegant scarves with silk blends: Gokana (30/2, 80%silk/20%cashmere) and 1 skein of Silken Fog (30/2, 55%silk/45%yak) Click these two links to add these yarns to your shopping cart. Want a little variation? 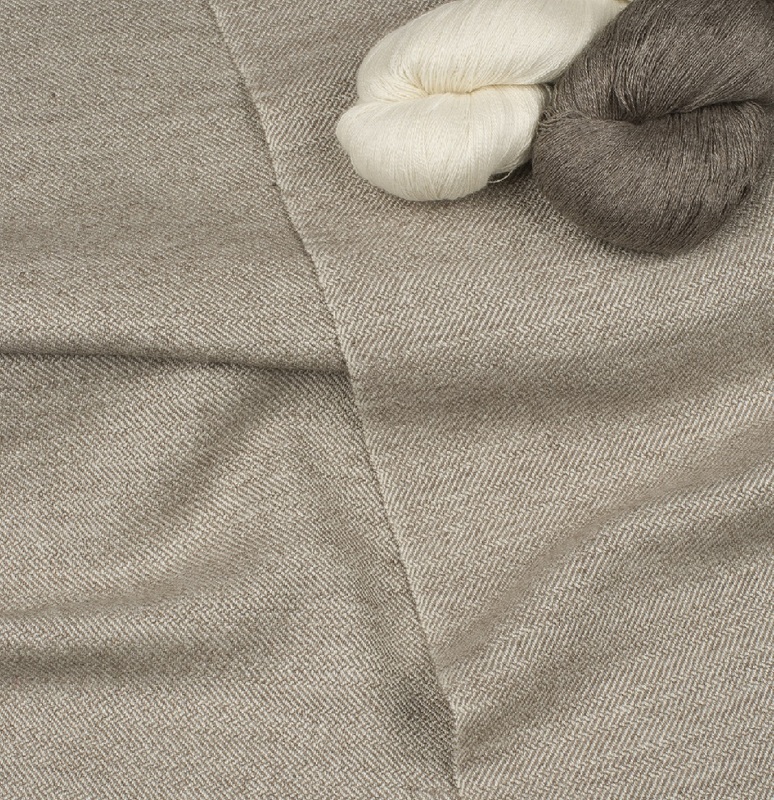 You can subsitute Camelot Chameau (30/2, 55%Silk/45%Camel) for the Silken Fog to make a lovely camel color. Or you can substitute Silken Ankara (30/2, 55%Silk/45%Angora Rabbit) for the Gokana. 2Skeins make 2Scarves, each scarf is approx. 9" wide, 72" long, sett 36 EPI. These scarves are near-and-dear to my heart--this was on my loom in 2011 when I learned that Treenway Silks company was for sale. 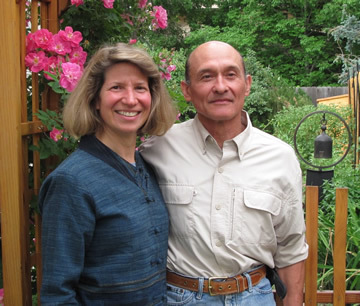 I thought it fortuitous that I was weaving with Treenway Silks--and we are honored that the founders, Karen & Terry, chose us to become the new owners. This draft has added a little border along the selvedges to add a bit of spice--I wish I'd have thought of this while weaving my scarves. 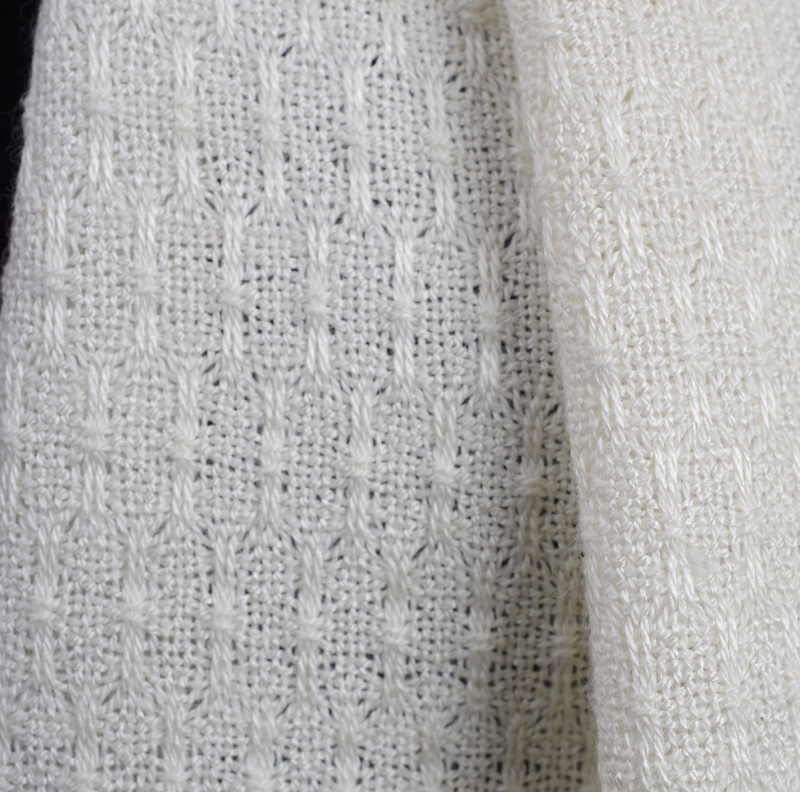 These elegant huck lace scarves can be made on a 4-shaft loom with just two skeins of silk. Combining 100% silk yarn with a silk-blend yarn gives these luxurious scarves a wonderfully soft hand. This is the perfect scarf when elegence is desired. Anyone on your gift-list would love getting one of these scarves. We created our Soft & Elegant Huck Scarves with natural white Taiyō (100% Bombyx Spun Silk, 30/2) and Silken Ankara (55%Silk/45%Angora Rabbit, 30/2). 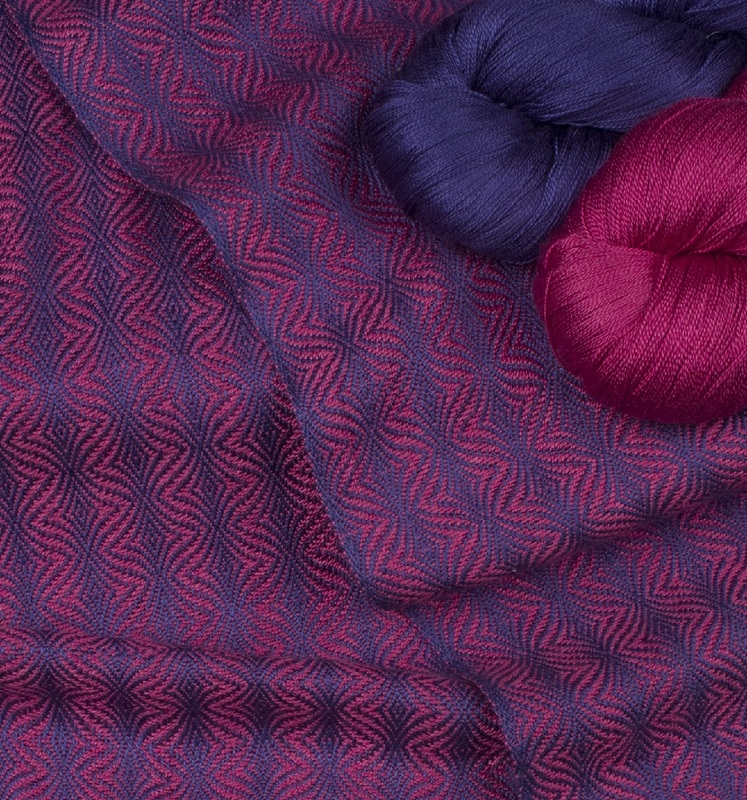 Click these two links to add these yarns to your shopping cart. Want to introduce a little color? 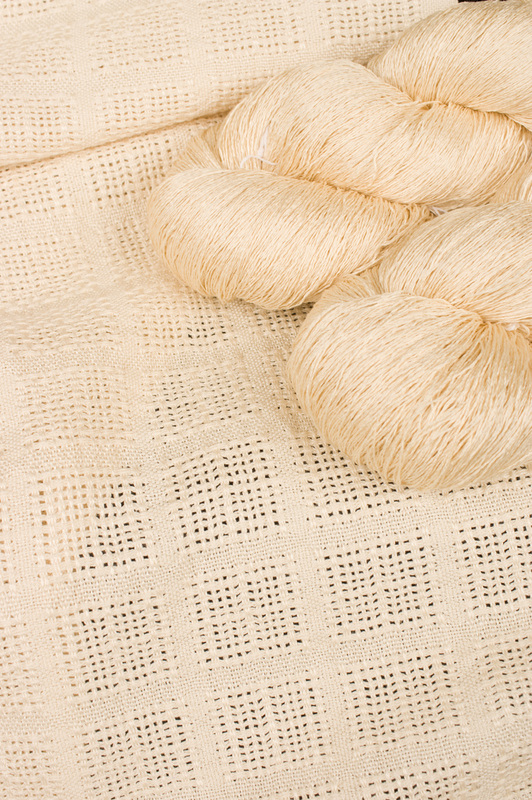 We think natural white Taiyō and Camelot Chameau (55%Silk/45%Camel, 30/2) would be stunning. Click these two links to add these yarns to your shopping cart. Or pair Taiyō in color #57 Raven Black with Silken Fog (55%Silk/45%Yak, 30/2). Click these two links to add these yarns to your shopping cart. 2Skeins make 2Scarves, each scarf is approx. 9" wide, 72" long, sett 30 EPI. Try our ‘Squares of Lace’ Swedish Lace scarves. Weave 2 fabulous scarves with 2 skeins of our most popular silk yarn, Kiku (100% Bombyx Spun Silk, 20/2). This uses both colors in the warp and the weft. What a perfect gift for someone special! We wove ours with colors #41 Pistachio (green) and #216 Soft Iris. But you can select any two colors you want! Go to Color Now! Kiku to order your favorite colors! There are so many combinations that would look fabulous! Lighter colors and colors that look lovely blended together will make your scarves gorgeous both up close and at a distance. Here are just a few combinations we like, just to get you started! These lovely huck lace window pane block scarves can be made on a 4-shaft loom with just two skeins of Silken Cloud (70% bombyx silk / 30% cotton) yarn or with just two skeins of Resilience (60% silk/40% retted bamboo) yarn. Sandy Hutton used Silken Cloud yarn to create the “Blouse for Susan”, published in Handwoven J/F 2015. We both love the large lace block set between stripes of plain weave, so Sandy used it again to create this lacey scarf. I absoluely love wearing my blouse--the fabric is wonderful against my skin. I know you'll love wearing this scarf just as much! The silk/cotton blend or the silk/retted bamboo blend give these lovely scarves a crisp hand which softens while you wear it and stays cool. This is the perfect scarf to wear at summer events. We created our Summertime in natural white using Silken Cloud (70% bombyx silk / 30% cotton). But you can substitute Resilience (60% bombyx silk/40% retted bamboo)--follow the same directions, including sett. Click on either link and add skeins of yarns to your shopping cart. 2Skeins make 2Scarves, each scarf is approx. 8.5" wide, 72" long, sett 30 EPI. 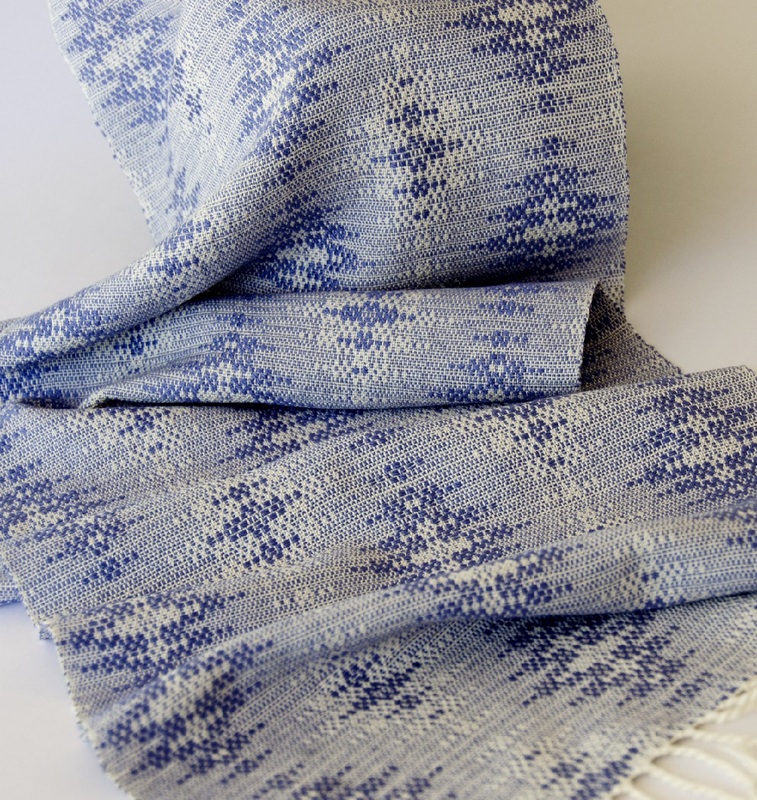 Try our ‘Tidal Pools’ Shadow Weave scarves. Weave 2 fabulous scarves with 2 skeins of our easy to manage silk yarn, Zola (100% Bombyx Spun Silk, 12/2). We used Yasulyn (no longer available), but Zola is just as suitable. Shadow weave uses both colors in the warp and the weft (alternating light/dark in both warp and weft). As shadow weave needs 2-shuttles, can be a bit slower to weave, but the intricate design with just 4 shafts makes it one of my favorite weave structures. And, if you switch the starting order of the yarn colors, you get a completely different design--a fun option for the second scarf! Weave one for yourself and give one as a gift! We love combing two colors in this shadow weave design—value constrast (one yarn lighter, one yarn darker) is important for the design to show. We wove ours with colors #4 Rendezvous Blue (navy) and #10 Malachite (green). But you can select any two colors you want! Go to Color Now! Zola to order your favorite colors! There are so many combinations that would look fabulous! But, remember to have a value contrast (lightness and darkness) for your design to show. (We first tried the darker green #9 Emerald Dream rather than #10 Malachite on our first attempt, and there wasn't enough value contrast for a pleasing result.) Here are just a few combinations we like, just to get you started! 2Skeins make 2Scarves; each scarf is approx. 5-3/4" wide, 58" long (plus fringe), sett 20 EPI. We love combing two colors in this shadow design—both colors are used equally in the warp and in the weft. We wove ours with colors #20 Bordello and #57 Raven Black. But you can select any two colors you want! Go to Color Now! Kiku to order your favorite colors! There are so many combinations that would look fabulous! A value difference between your two colors is important--having one color that is lighter or darker than the other is necessary to enble the lovely pattern be visible. Here are just a few combinations we like, just to get you started! 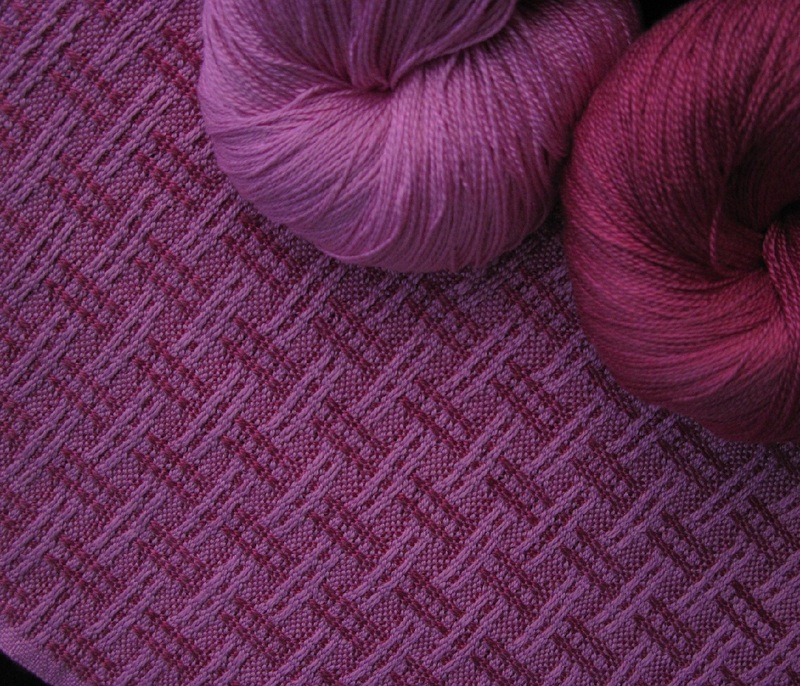 We wove ours with colors #47 Cherry Blossom (weft) and #223 Star Ruby (warp). But you can select any two colors you want! Go to Color Now! Kiku to order your favorite colors! Try our ‘Summer Trellis’ Plaited Twill Scarves. Weave 2 fabulous scarves with 2 skeins of our most popular silk yarn, Kiku (100% Bombyx Spun Silk, 20/2). This twill has a different look on the front and the back--both beautiful! What a perfect gift for someone special! 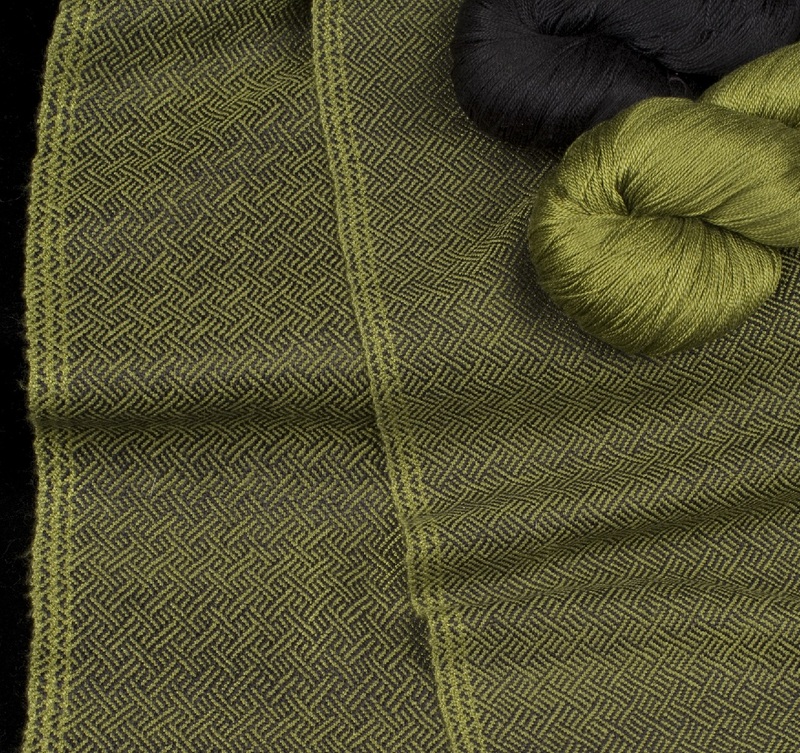 We wove ours with colors #952 Pheasant Green (weft) and #57 Raven Black (warp). But you can select any two colors you want! Go to Color Now! Kiku to order your favorite colors! There are so many combinations that would look fabulous! We think some value difference between your two colors is helpful--having one color that is lighter or darker than the other will help the lovely pattern be visible. Here are just a few combinations we like, just to get you started! 2Skeins make 2Scarves; each scarf is approx. 8" wide, 72" long, sett 28 EPI. Try our ‘Ice Crystals’ Crackle Scarves. Weave 2 fabulous scarves with 3 skeins of our 100% Bombyx spun silk yarns: Gekkō (60/2x2 spun silk) for the warp and tabby weft and Kiku (20/2 spun silk) for the pattern weft. What a perfect gift for someone special! 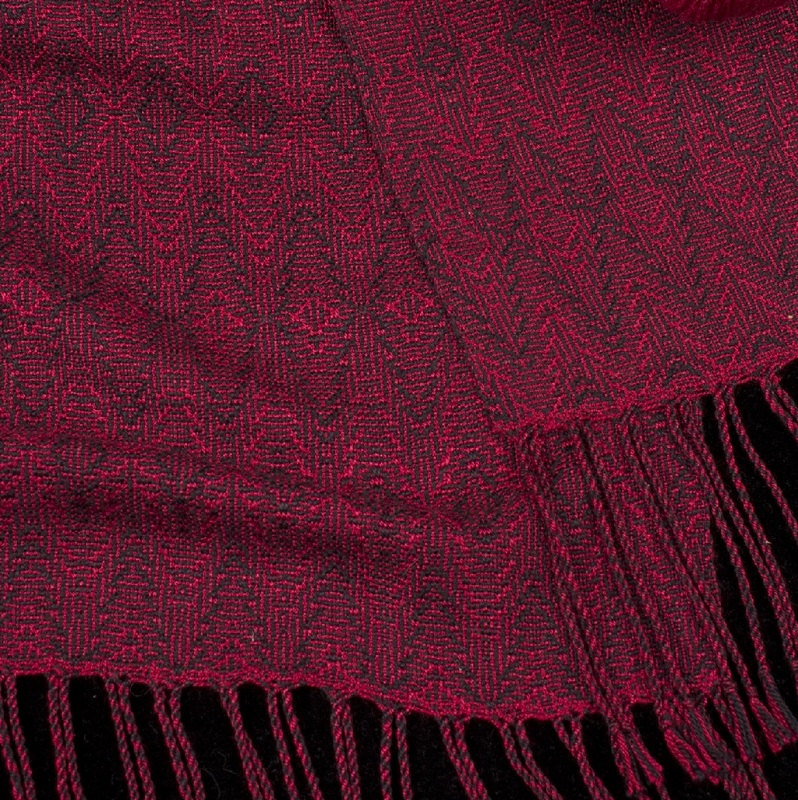 --Weave two scarvesWe love combing two colors in this shadow design—both colors are used equally in the warp and in the weft. The crackle structure allows the pattern weft color to peak through the background. 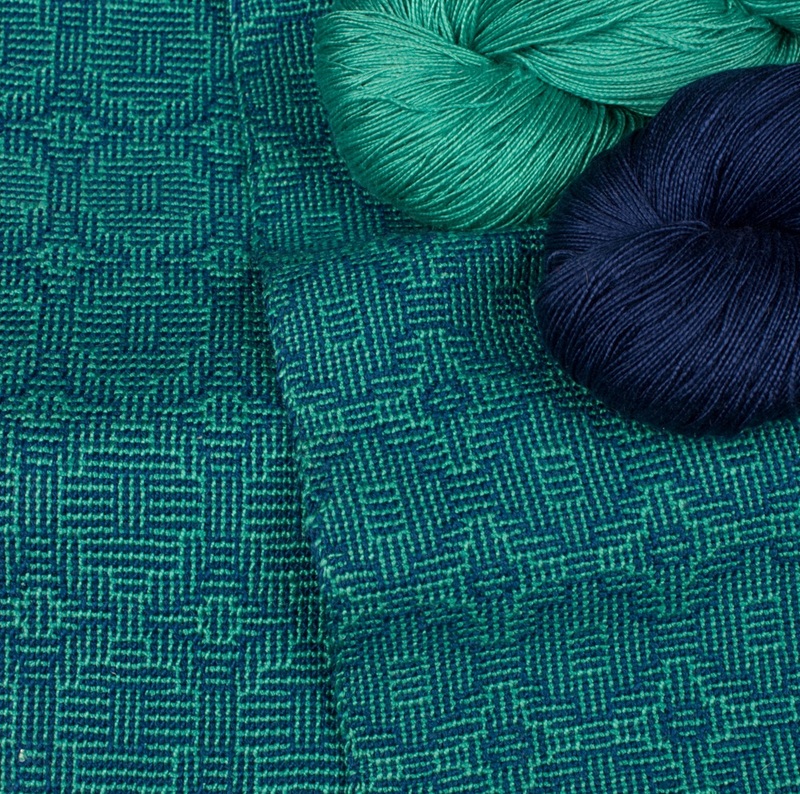 We think blues and greens would be especially lovely as a patten weft. A red color may give the effect of 'bleeding,' so consider that when choosing colors. 3Skeins make 2Scarves; each scarf is approx. 10.25" wide, 72" long, sett 30 EPI.